Water rotates all around us. In some instances, it rotates by winds and weather, in others, by energy pumping it through systems, and yet, it also rotates through the water cycle. Ultimately, we need to acknowledge that all water is "borrowed water," used and reused in many ways, carrying valuable resources that merit recovery. Communities harness the water and its associated elements for sustainability yet there is so much about water that we do not know. Nearly every day, we discover new ways to protect and manage water—changing the way we think about it. As a global community, we must open our minds to new ideas when we discuss the subject of water. The Water Environment & Reuse Foundation works with many Texas communities to conduct research to treat and recover beneficial materials from wastewater, stormwater, and seawater. The materials recovered include water, nutrients, energy, and more. WE&RF aspires to deepen the understanding of water's many uses so informed discussion is possible. For example, water reuse is frequently rejected due to fear and distrust. However, research has shown that acceptance of water reuse is greatly enhanced when people have a grasp of how regularly it occurs in the conventional water cycle. Water must be seen in the whole of the water cycle—not only as drinking water or rainwater but as water in a cycle. Often when presenting, I remind audiences that the water we use today may have had other uses when the dinosaurs roamed the earth. Once the public understands the context and the basics of technology, the notion of drinking water that was "used before" becomes a more comfortable conversation. Beyond recycling water, changes in practices and processes have led to new configurations on wastewater treatment plant campuses—driving capital improvements to transform them into community assets producing incremental revenue and products, and delivering public health and environmental protection that often exceeds regulatory expectations. What if these facilities had all of the outputs illustrated below? Energy, recycled water, fertilizers, and more—"borrowed" water's value to the community becomes evident. Take Austin for example. For water protection, Austin Water manages about 28,360 acres of Water Quality Protection Land for the city of Austin. Over half of that land is in a conservation easement. The city of Austin owns the remaining 38 percent in fee simple. Also, Austin Water manages approximately 13,000 acres of Balcones Canyonlands Preserve to conserve habitat for two endangered songbird species (the golden-cheeked warbler and black-capped vireo) and numerous other wildlife species. This open land is a valuable community asset provided as a part of the water system, yet likely not recognized as such. Austin has two wastewater plants that pump biosolids to a central biosolids facility, the Hornsby Bend Biosolids Management Plant, which generates multiple products. Solids digestion creates biogas that generates more than enough electricity for the Hornsby Bend Plant. Perhaps this is another untapped energy resource in Texas. Compost is generated at Hornsby Bend, too. The City of Austin uses the compost on its property. The compost also sells as a wholesale product for landscaping use yet the plant offers even more valuable community assets. Hornsby Bend also has a laboratory that acts as a center of research for both the University of Texas at Austin and Texas A&M University. Its lagoons use natural treatment and no chemicals, which have drawn birds to seek refuge there. As a result, the area is a popular birding site and a unique community asset. 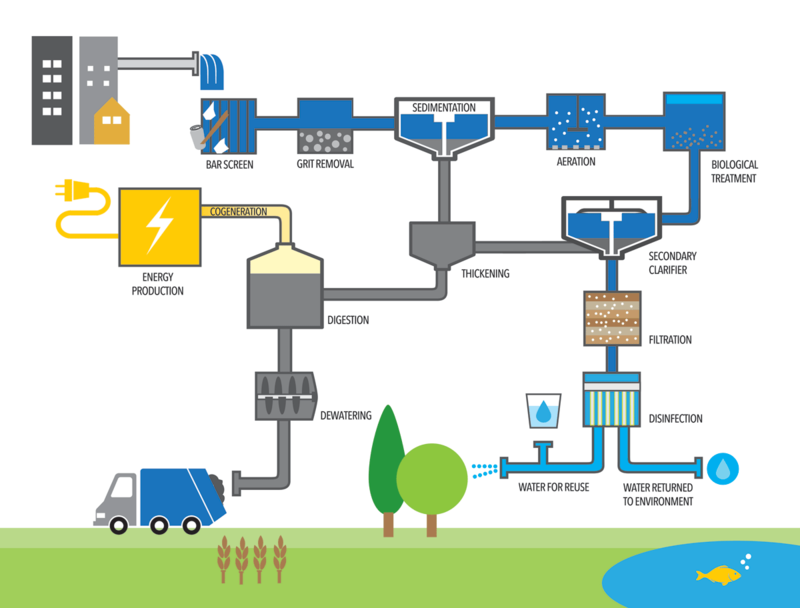 Austin has two water resource recovery facilities to directly engage in highly treated wastewater reuse actions. The 51st Street Storage Tank provides more than one billion gallons of reclaimed water annually, serving the University of Texas at Austin and other institutions. This recycled water provides supplies for irrigation, cooling, and manufacturing. Austin Water plans to extend reclaimed water services through the distribution of 5.5 billion gallons of water per year. The Austin story clearly presents that we are all living downstream. Across the country, we see models similar to Austin where the water cycle plays out fully within the water treatment processes. Atlanta, Los Angeles, Philadelphia, and Chicago all have excellent examples of the water industry generating resources such as energy, fertilizers, and water for their communities. Recovering these new resources creates jobs and incremental income while protecting ecosystems and human health. By opening our minds to these emerging ways of thinking about water, we have a unique opportunity to create an evolved, innovative approach to managing the water that we borrow from past and future generations. Melissa Meeker is CEO of the Water Environment & Reuse Foundation (WE&RF), a research foundation seeking solutions for integrated water with a focus on innovatively expanding safe water supplies and recovering all beneficial materials in the water cycle. Melissa has more than 25 years in water resources management, with an emphasis on alternative water supply development. She holds a Bachelor of Science in biology from Palm Beach Atlantic University, and a master's in environmental resource management from Florida Institute of Technology. For more information, follow Melissa on Twitter @MLMeekerWERF, or visit www.werf.org.